Fang peoples, Betsi group; on 19th century, Wood, raffia, H. 22 1/16 in. (56 cm.). Musée Dapper, Paris. 2891. NEW YORK.- The Metropolitan Museum of Art will present a special exhibition of acclaimed sculptural masterpieces from the heart of Africa’s equatorial rainforest, beginning October 2, 2007. The exhibition explores not only the significance of the works presented in their countries of origin but also how their reception in the West led them to enter the mainstream of universal art. 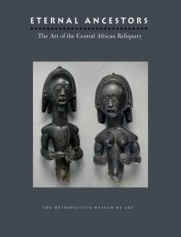 Organized thematically, Eternal Ancestors: The Art of the Central African Reliquary explains the sources of cultural and spiritual inspiration that led to their creation in equatorial Africa. Drawn from the most important collections of African art in Europe and the United States, the more than 130 works featured in the exhibition relate to 12 distinct traditions in Cameroon, Equatorial Guinea, Gabon, the Republic of Congo, and the Democratic Republic of the Congo. They were created to celebrate the lives of an extended family’s most notable ancestors and to give expression to their ongoing role as advocates with the divine. Many of the works on view won renown as fresh sources of inspiration for early 20th-century Western avant-garde artists, who collected them and kept them in their studios. The excitement generated by those works when they first came to the attention of artists in Paris, Berlin, and New York is reflected in such colloquial names as “The Black Venus” and “Great Bieri,” titles by which they have been known ever since. Pablo Picasso, André Derain, Maurice de Vlaminck, and Henri Matisse were among the many artists who not only collected African sculpture but who also carefully studied it in the newly formed ethnographic museums of the day. The exhibition is made possible in part by the William Randolph Hearst Foundation. In the traditions of central Africa, as in many other parts of the world, ties to notable ancestors have been maintained through preservation of sacred relics. The exhibition opens with a series of comparisons between celebrated sculptures, such as 19th-century Fang reliquaries created in Gabon with works from the Metropolitan’s superb medieval and Asian art collections. These comparisons afford a unique opportunity to appreciate conceptual parallels between some of the most exalted expressions of devotional art in the history of Western, Eastern, and African civilizations. Among the highlights of the exhibition are the wood heads, half-figures, and full figures carved by Fang masters. Created to be positioned at the summit of bark receptacles, the works are striking for their synthesis of intensely introspective contemplation and physical dynamism. In this exhibition, two of the most renowned Fang creations will be reunited for the first time since they were in the collection of the sculptor Jacob Epstein during the first half of the 20th century; they are the Female Figure once owned by Derain and now by the Metropolitan, and Seated Female (“Black Venus”), a stunning figure unrivaled in its synthesis of elegance, grace, and physical power, on loan from Musée Dapper in Paris. These two exceptional masterpieces were part of the early wave of African artifacts to arrive in Europe that came to be identified as muses to a new direction in the history of art. Also featured are two-dimensional wood figurative elements sheathed in precious metals created by the Kota and Mahongwe peoples in Gabon and the Republic of the Congo. Among the seminal examples on view is a Sculptural Element from a Reliquary Ensemble (Museé du Quai Branly) created by a Kota artist. Made of wood, brass, and copper, this historically important piece was collected over the course of an exploratory journey to the region by the French 1883 expedition led by Pierre Savorgnan de Brazza. It entered the French national collections and was included in the earliest exhibition of artifacts from the region sponsored by France to promote interest in its colonial expansion at the Orangerie du Jardin des Plantes in 1886. Yet another distinctive genre consists of Bwende and Bembe soft sculptures from the Republic of Congo, with their emphasis on a vibrant red palette, strategic use of contrasting textile patterns, and grand cosmic gestures that announce their role as active intermediaries with the divine. Among the most spectacular and rare examples is a life-size Female Figure by the Bwende master Makosa of Kingoyi that was collected by the Swedish missionary Efraim Andersson in 1938 (Museum of World Culture). Film - Film footage in the exhibition will emphasize the importance of performance rites as devotional forms of expression and demonstrate the music and dance that are integral parts of those ceremonies. While acknowledging that these works have ultimately transcended their original cultural contexts, the exhibition seeks to examine them on their own terms. The exhibition is organized by Alisa LaGamma. A variety of educational programs will be presented in conjunction with the exhibition, which will also be featured on the Museum’s Web site ( www.metmuseum.org ). For the last news about African Reliquary you should join our African Art Club and become an insider of the African art market.